Behavioral change is one of the most difficult endeavors for strategic leaders. Too many great ideas and initiatives fall flat on their face because there isn’t a solid change management strategy to change the behaviors of people necessary to realize the potential of an initiative. You need to make change systematically, thoughtfully, with strong momentum and reinforcement. 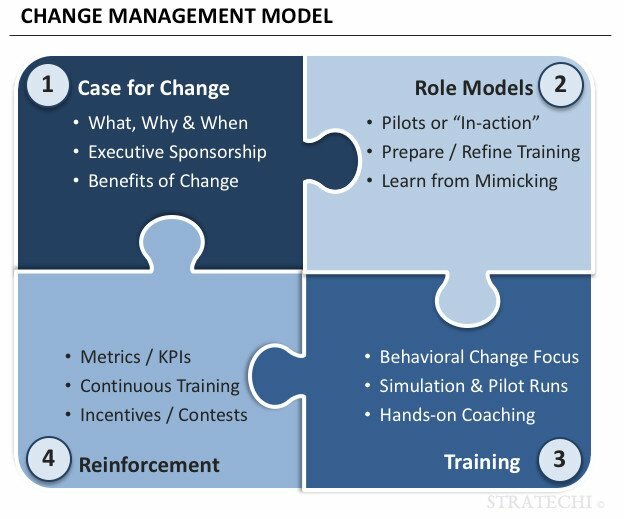 I’ve used the change management model to enable behavioral change for many major initiatives, including reorganizing and implementing a new management system with 15,000 associates at a leading specialty retailer, rolling out new pricing systems at a multi-billion industrial company, and a vendor negotiation initiative involving hundreds of negotiators at a multi-billion dollar insurance company. What is the change management model? It is essential to have a compelling story of what the change is and why it is important. Leadership needs to own the change messaging and communication and reinforce the case for change as often as possible to all of the involved parties. People learn from role modeling. Finding the right role models, celebrating them, and having them tell their story of how the change improved them and the situation is foundational to driving broader change. Role models are often created from the pilot phase of an initiative. For people to change their behavior, they need the necessary training, tools, and skills to understand expectations and how to embrace the change. You have to think through and roll out the necessary training, tools, and skills for a successful change management program. You also should have reinforcing mechanisms, feedback, and incentives to ensure people are changing their behavior. These reinforcing mechanisms include metrics, reporting, incentives, feedback sessions, contests, processes, controls, and systems. How do you use the change management model? Thinking through, planning for and maximizing the four conditions of the change management model will get you a long way in driving the desired behavioral change. Below are some best practices for the change management model. 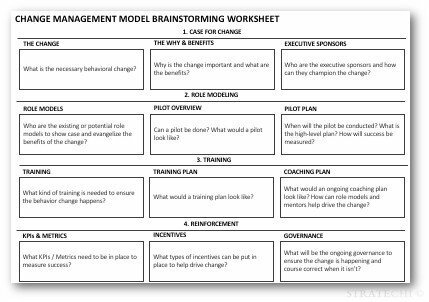 Assemble a group of stakeholders and brainstorm different ideas across the four conditions of the change management model. Involve the right people to generate quality ideas and buy-in. Make sure you utilize a diverse group of people including leadership, managers, and front-line employees. Prioritize ideas based on what will have the most impact on driving behavioral change. Make sure the ideas address the human aspect of change, and not just the improvement of metrics and KPIs. Develop a change plan, which will help you think through the sequencing and scheduling of the strong change management ideas. In developing the plan, continuously think through how you can reinforce the four conditions through every phase of the plan. In developing ideas, hear the “voice of the team members.” Design the ideas with and around the people you are trying to drive behavioral change. Make it personal for them, and not another corporate program. In any change program, there should be significant over-communication across all four conditions. Change is hard, and, the bigger the upfront investment, the higher the probability of positive change. 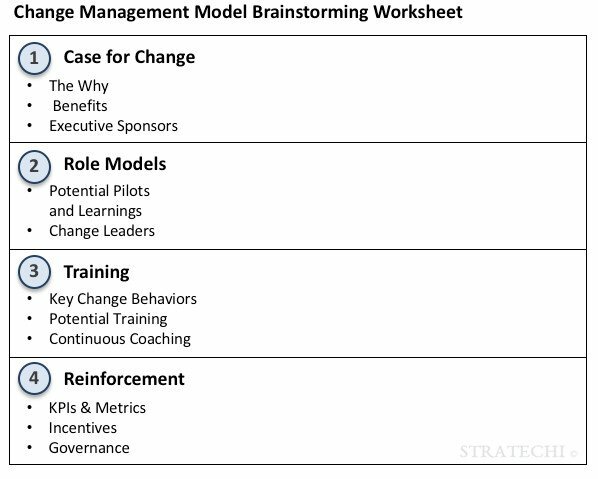 Below is a simple worksheet to help you think through the change management model. 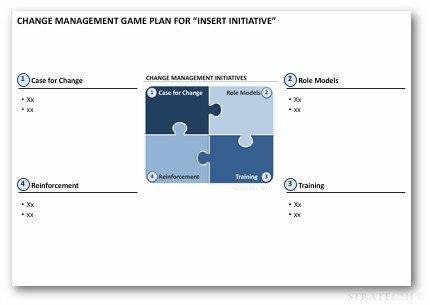 To get you going on thinking through the change management of an initiative, download the free and editable Change Management PowerPoint Worksheet & Game Plan.